Well it’s going to be some semi-final. Tsonga, or Jo-Willy, blitzed the former Fedex in three sets that were not even close. While against Simon, Fed was able to raise his game, here Jo-Wilfred just kept on hammering away, breaking Fed twice in set three. While Federer has a record of over the last 36 grand slams reaching the quarter-finals or better, only five of those occasions has he failed to get past the quarters. 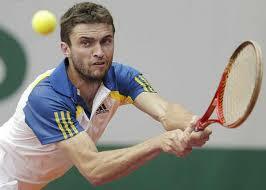 On two of those occasions he has now been beaten by Tsonga, the others twice by Berdych and once by Soderling. All are big hitting, high risk players. If their game comes off with few unforced errors they are extremely hard to beat by anyone but Federer seems to have had more problems with them than the other members of the top four in the last three years. Indeed all three sets felt a little like the last three in the quarter-finals at Wimbledon in 2011, when Federer was beaten by Tsonga having been two sets up. 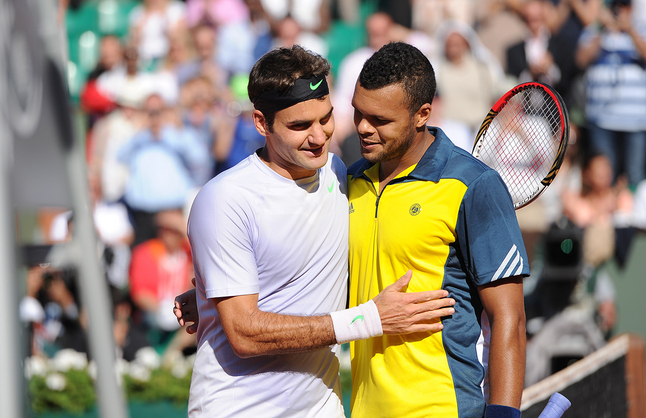 Three sets in which, it seemed, Tsonga could do no wrong and Federer could not find an answer. Today there was no lifting of the Federer game in the way he managed in the last round. Of course Jo-Wilfred is so amazingly popular and continually seems to play with a smile on his face, that even someone as popular as Federer will have the crowd against him. While watching Jo play Djokovic last year one of my kids mused that he was so popular that even Novak’s coach was cheering him on! And so to the women – Serena advanced but with a hiccup, losing the second set to the experienced Svetlana Kuznetsova. Kuznetsova was rolled over in the first set and using her experience she took a time-out – a visit to the bathroom. Unusual so early in a match but it worked, quickly rolling off the next four games and winning the second 6-3. What had threatened to be over quickly turned in to a classic, with two experienced campaigners raising their games and Serena running out the eventual winner, 6-3 in the third. In the other ladies quarter-final played today, the pocket sized and purposeful Sara Errani, came through 6-4 7-6. At 3-1 down in the second it looked like Errani might be taken the distance but she battled back and took the match on the tie-break to set up another ‘little and large’ battle in the semis against Serena. Meeting the challenge – again and again! Well experience delivers once again –Tommy Haas reached the quarter final at Roland Garros for the first time, in decisive manner against Mikhail Youzhny, at the tender age of 35! Once seen as a boy wonder and future world number one (he got to number 2 in the world in 2002), a year ago Tommy was outside the top 100, yet here he is, at the tail end of his career, with his best ever performance at the French Open and ranked just outside the top 10. Today he played extremely well. Having his serve broken in the first set, he then reeled off six straight games to win the first set 6-1. With Haas playing well, rather than respond by lifting his game, Youzhny did what so many of us do, in that reeling he looked out of sorts, got angry and making mistake after mistake, going on to drop the second set 6-1. In the final set Youzhny found some sort of form, making it more competitive but continued to lack belief and Haas ran out the winner in a straightforward 6-1 6-1 6-3 to set up a quarter-final with Djokovic. Djokovic himself did not looking too convincing, having come through his first three rounds straightforwardly, he dropped the first set in his fourth round match against Kohlschreiber, before running out the winner in four sets. On the other hand, Nadal will be relatively pleased, after beating Kei Nishikori in straight sets, he sat back to watch his next opponent, Stan Wawrinka, battle through a five set match of the highest quality. Richard Gasquet has now lost five grand slam matches having been two sets up but this was no capitulation in the manner of his loss to Murray at Wimbledon five years ago. These two players, ranked nine and ten in the world, gave it their all, with Gasquet winning the first set tie break, having looked second best throughout the set, he then looked more convincing in the second, winning it 6-4. It was in the third, when Stan got angry after a dispute with the umpire over line calling, that he seemed to use to motivate him, winning the set 6-4 and getting the late break in the fourth to level and take the match into the final set. Both players continued to go for their shot and managed to hit winners from the back of the court. 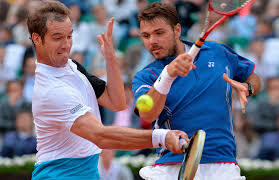 Despite the momentum moving firmly in Stan’s direction and Gasquet looking visibly tired by the end of the fourth set (requiring a medical tie out) it wasn’t until the fourteenth game of the final set that match Gasquet faltered and Wawrinka won it with a forehand down the line. 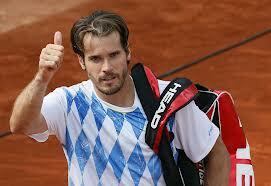 Gasquet will undoubtedly feel gutted but both men played their part in an outstanding match. Can Stan recover sufficiently to threaten Rafa in a couple of days? Well what an amazing match! Federer started in sublime fashion, moving Simon about and almost running away with the first set 6-1. Simon has regularly given Federer problems in the past and, in the next two sets we saw why, as Simon pressed and almost everything he went for worked, winning the next two sets 6-4 6-2. So how do you feel when you’re up against someone at the top of their game? For Federer, his reaction was what you might expect of someone who has been at the top of the men’s game for the last decade – he lifted his game and in a set of outstanding tennis he leveled the match with a 6-2 set. For Simon this was something of a body blow, he did little wrong and when he got to Federer’s drop shots Fed was there to put the next ball away. One of the things Federer does consistently is follow the drop shot into the net, despite it being taught and the obvious tactic, it surprises me how many of the top players stay back after playing a drop shot. At one point in answer to a short Federer ground stroke Simon drove his forehand cross court, for what would in most cases have been a winner, only to see Federer take the ball off the bounce and pass a disconsolate Gilles down the line. By the final set it seemed that Federer was almost into exhibition mode, playing a drop shot, following it in and then volleying a lob over the incoming Simon. In the end Federer ran out a 6-3 winner in the fifth and extended his record of reaching the quarter-finals or better of the last 36 grand slams.